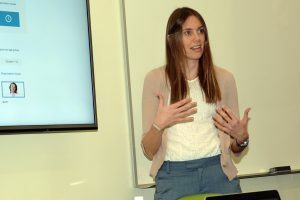 Brittney Beck led “design-thinking” workshops, like the one at the top, to bring together students and community stakeholders to collaborate on ways to improve learning for preschool students and English language learners. Many of the most enduring challenges facing the U.S. education system defy simple solutions. For example, how to improve the educational outcomes for preschool children and for students whose first language is not English? Finding solutions to these issues will go a long way to determining the future of millions of young people. But there are many challenges to overcome. Education scholars have found that disadvantaged children who start kindergarten with fewer social and academic skills are more likely to fall behind their peers in school. Similarly, the academic performance of students classified as English language learners (or ELLs) — perhaps the fastest-growing segment of the public school population — falls well below their peers and they experience disproportionately higher dropout rates. “It’s necessary to recognize that these issues are so large and complex that no single teacher or school can hope to solve them independently,” says Brittney Beck, a doctoral candidate in the School of Teaching and Learning at UF’s College of Education. 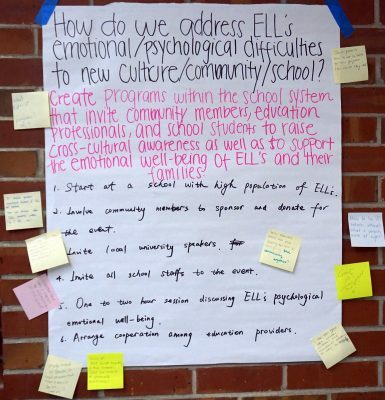 This understanding led Beck to organize two separate “design-thinking” community workshops for stakeholders of the Alachua County Public Schools District to explore the myriad issues of early learning and ELLs, with a particular focus on the problems of children growing up in poverty. Participants were assigned to groups and they posted ideas about how to solve educational challenges during brainstorming sessions. All told, Beck’s three-hour workshops attracted 114 education students, UF College of Education faculty and staff, and representatives of local schools and community organizations. Participating students included those in Beck’s Introduction to Education classes and faculty lecturer Jo Kozuma’s course on second language learning and teaching. Beck made use of her training in “design-thinking” processes to organize the workshops and spark engagement among participants. Attendees broke into groups of interdisciplinary stakeholders and Beck guided them through phases of the design-thinking process, including storytelling, root problem identification, ideation and small-scale experiments. Community members who attended one or both of the workshops included officials from Alachua County Public Schools, the county library district, literacy groups, women’s advocacy organizations and Southwest Advocacy Group, a nonprofit that works to improve conditions for residents of impoverished neighborhoods in Southwest Gainesville. By the end of the workshop, each group chose the most viable solution and developed a way to test its effectiveness. A caveat: to limit pie-in-sky, budget-breaking ideas, they needed to take less than an hour and cost $10 or less. Among the solutions: Gather a large group of ELL advocates to attend meetings of the boards of local school districts to learn about its commitment to ELLs and to speak about the need for more culturally enriching experiences for all students. One of the student participants in the English as a second language workshop last fall was Cy-Anne Small, a junior in the college’s ProTeach Unified Elementary Education Program. Small said she collaborated with Victoria Condor-Williams, president of the Latina Women’s League, a nonprofit organization that works to improve Latino/Hispanic culture and art in Gainesville. Beck noted that scholars have found the most effective way of addressing the deficits of ELLs is to draw from students’ existing cultural and linguistic assets. Already, some participants are independently organizing a follow-up workshop. Theresa Sterling, literary director for the Alachua County Library District, is teaming with two UF scholars to host a workshop on March 3 to discuss multiple perspectives surrounding plagiarism by English language learners, as well as strategies to address this complex issue. UF College of Education doctoral students Hyunjin Jinna Kim and Aleksandra Olszewska are helping to coordinate the event. Beck said she is working with Jennifer Taylor, supervisor of guidance and student services for Alachua County Public Schools, to coordinate another workshop this spring devoted to the unique challenges faced by LGBT students and educators.